IBM’s Watson supercomputing platform has been around for roughly four years now, and is always managing to surpass expectations and wow the public with it’s unprecedented ability to carry out clever functions. Recently, Chef Watson, a food oriented ‘cognitive cooking system’ developed in partnership with the Institute of Culinary Education, has been helping chefs pick out ingredients in the kitchen. The computer can identify which ingredients go with others from a massive selection and create new combinations. Chef Watson hasn’t only been hard at work choosing new and interesting combos of ingredients, but also has found the time to assemble an entire cookbook of recipes chosen by the machine. Yes, the computer has produced a book – a collected selection of 65 recipes thought up by the thinking engine and brought to life by top chefs at the ICE. 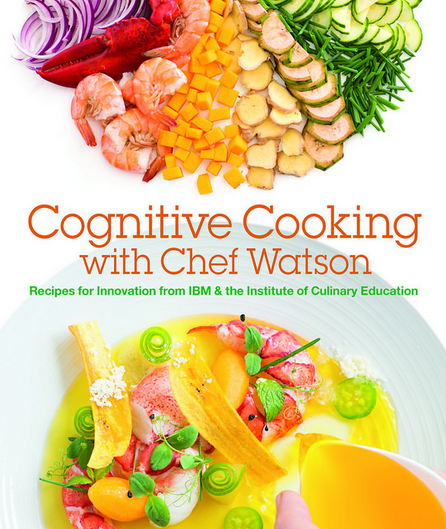 Cognitive Cooking with Chef Watson is the culmination of the computer’s years in the kitchen, indeed Chef Watson has already had somewhat of a career in the field. Watson has previously overseen recipes created on a food truck offering Chef Watson designed meals, plus the computer has also serves as sous chef on its own website in partnership with Bon Appetit. Watson is your friendly neighborhood supercomputer. Watson is just one example of what future ‘cognitive computing’ could offer. Smart ultra intelligent learning systems, forming a ‘simulated intelligence’ could one day serve as partners for many industries. information gathering, compiling and usage could all be performed by companion intelligences via computers. It’s not going to lose people their jobs, but it will end up saving a lot of time. Watson isn’t just helping people with food – the thinking and learning systems aboard it can be used in many fields outside of just cooking. Watson can think like a person, using language for its though processes and picking up new terms and information as it goes along. This is a great help when its put into practice with medicine – the idea is to get Watson to understand and think out patterns in the genomes of individual patients. This in turn will help create what’s known as ‘genomic medicine’ – drugs designed specifically for a patients with complex or rare diseases which require an individually tailored response. Individual genomes represent huge reams of information – all of which Watson can sift through in seconds and identify problems and relationships between genes extraordinarily quickly. It’s absolutely amazing just what computers today are capable of – in Watson’s case, they appear to be fast outpacing humans in terms of ability. We all have amazing imaginations, but when information with so many variables is presented to us, a computer can often see the bigger picture and get results more quickly and more reliably.